Hard drive specialist Seagate has announced availability for its 160GB 7200rpm laptop hard drive. The company is claiming a "world's first" on the Momentus 7200.2 drive because it also boasts perpendicular recording technology as well as "freefall" technology to minimise damage to the 2.5-inch drive's read/write head if the laptop is dropped. 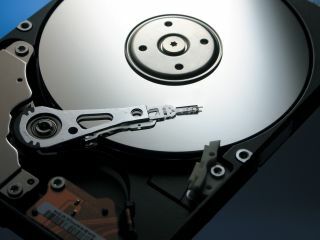 Perpendicular recording technology does pretty much what it says; data is stored upright on the surface of the disk instead of flat on the disk - meaning more data can be stored. That leads to bigger capacities on smaller drives. "The growing number of computer users turning to laptops as their primary PCs want every inch of capacity, performance and durability they enjoy in their desktop systems," says Seagate's Michael Wingert. Seagate says the freefall sensor works by detecting any changes in acceleration equal to the force of gravity, then parking the head off the disc to prevent contact with the platter in a free fall of "as little as eight inches." The new drive is offered in 80GB, 100GB, 120GB and 160GB capacities. And the 2.5-inch drive is perfect for users looking to upgrade their notebooks to deliver true desktop PC performance. Seagate has said it has shipped its range of FreeAgent external storage, shown off at CES.